1. I'm pretty sure I failed my students when it came to teaching them crucial writing skills. 2. My reading lessons next year need to include more writing. I've tossed around the idea of giving my kiddos a class blog. They love using the computer, and I think it would encourage them to write-- not to mention help them become more independent and excited to write! But for the time being I will work on adding items to my Writing Center to help my students just sit down and write. 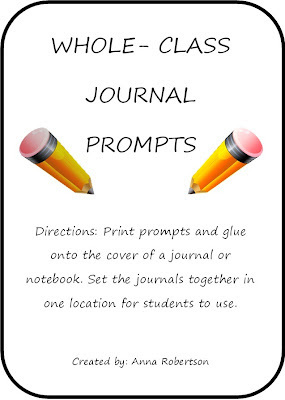 While I was on Pinterest I discovered "Whole Class Journals". These are notebooks with one theme, like: Puppies. So everyone can choose to write in that specific journal whenever they feel like it-- they just have to put their name/date at the top of their page-- and make sure they return the journal-- and make sure they stay on topic. Anyway, I saw this cute idea to glue the prompts on the fronts of the notebooks to make organizing easy. But, you know me, it's never as easy as it looks. I searched for printable journal covers... and failed. So I had my "ah-ha!" moment when I decided I could simply make it myself and share. So that's what I did! I really look forward to seeing what my kids come up with-- I think they will enjoy reading them as a class! My favorite prompt is "What would you do if you were in the middle of a lake and your boat started to sink?" My kids can be very creative-- I think there will be some funny answers. Click on the image below to download the journal covers! That last part was just for me, right? Even if it wasn't, I'm pretending like it was, just cause I like to feel special. Also, I wish I was in your class so I could write in the whole class journals... It sounds like fun! I love this idea! Thank you for sharing! I know what you mean by adding more writing...I need to do the same and have been searching for an idea to add intrest to my writing center. Thank you! THis was just what I was looking for to use in my class!!! Thank you for saving me the time of having to make these... it was exactly what I was looking for! This idea seems to be "heaven sent" to me. I just finished marking 28 stories from my class of gifted students. To say the least I am crestfallen. I need to find a way to get them writing MORE. I had seen the idea before on Pinterest of Whole Class Journals, but reading your blog post made it all much more clear to me. I love it so much I would like to invite you to come and share it at my New Year Linky Party I'm hosting on my blog (my first every party) at http://teachingisagift.blogspot.ca! I think there are many other teachers out there who would LOVE to download this freebie! I will be sure to let you know how it works with my class in the New Year....now I have to find some notebooks I can use:) That is what after Christmas sales are for right? I have resource students and have been looking at a way to implement MORE writing. We do not write near enough. We are so focused on reading, math and ELA that writing is often left out. :/ Thank you for this great idea. I'll be incorporating it into a work station next year! I really like this idea. I do have a question. Would you use this more like a center or would you do whole group? If you did whole group, you would have to have one per child. I am thinking I will use only have a few and the kids can choose one when their work is finished. Any opinions about this.